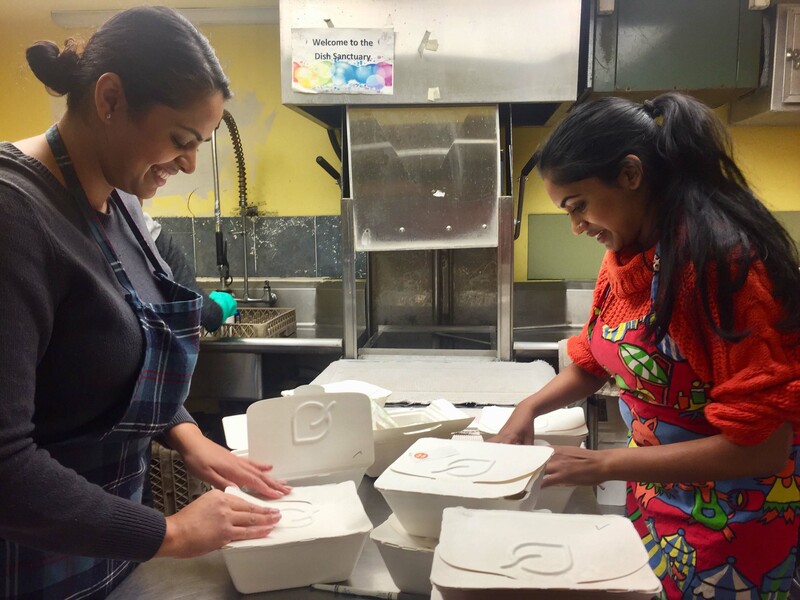 On Saturday, November 17, six members of the Toronto chapter of AYUDH and two mentors returned to St. Felix Centre to serve dinner to people struggling with homelessness, drug addiction and mental health problems. 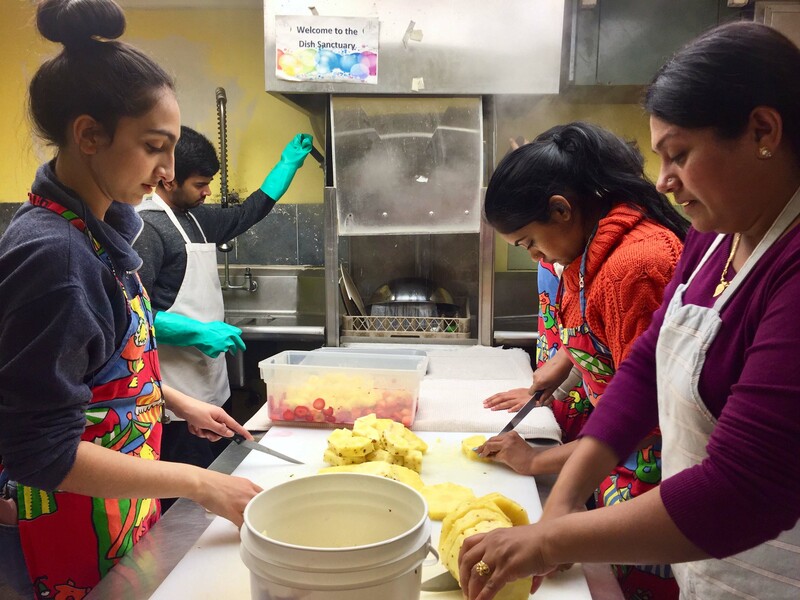 This was AYUDH Toronto's third time volunteering at this downtown multi-service community centre. St. Felix Centre serves three meals a day, seven days a week, so their need for volunteers is always high, particularly on weekends. St. Felix staff recognized and warmly welcomed the returning AYUDH members. They were overjoyed to hear that AYUDH Toronto plans to volunteer at St. Felix Centre on a regular basis. 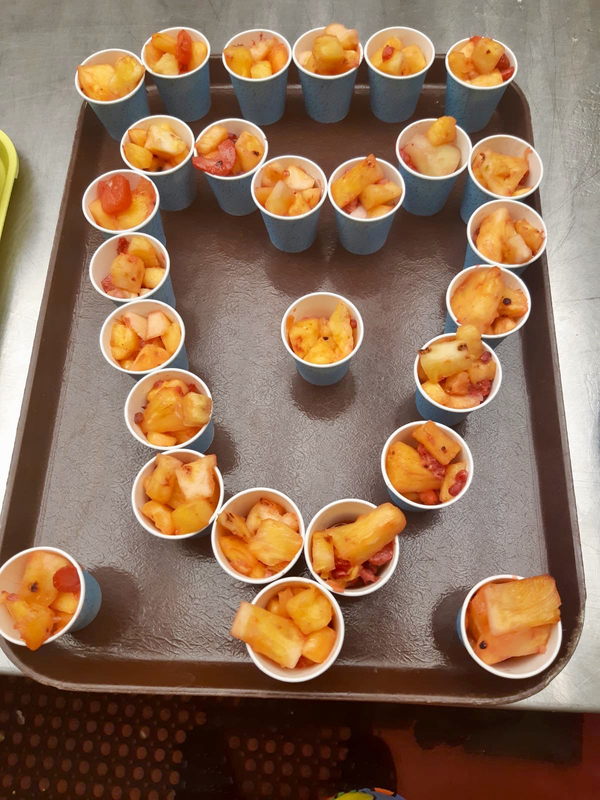 Under some time pressure, the youth and mentors helped prepare a balanced meal, including roasted potatoes, vegetable soup, yogurt, a muffin, green salad and fruit salad with pineapple. After serving the meal to St. Felix Centre's guests, they spent another hour and half washing and drying all the dishes and cleaning the kitchen. The youth worked efficiently and with focus, contemplating the reflection questions they were given prior to the event. Once the work was completed, AYUDH members and mentors said their goodbyes, and again all received hugs from the St. Felix kitchen coordinator. The youth and mentors then went out for a pizza lunch, and discussed their experience that day. When asked what they had liked and disliked about their experience, some youth commented that their work had tangible impact, and this was very appealing. Some said they disliked seeing only part of the food served get eaten; in many cases, the green salad and fruit salad were untouched and thrown away. A mentor acknowledged that it is indeed difficult to see part of the food one worked hard to make being wasted. However, we ultimately do not know the reasons why certain items were not eaten. Many people living on the streets have problems with their teeth and cannot easily chew raw fruits and vegetables. It was noted that the vegetable soup, in contrast, was generally well eaten. Contemplating these possibilities helps us to accept the unwanted outcome without judgment, and adjust our actions accordingly. Prior to serving at St. Felix Centre, the AYUDH members were asked to imagine that Amma was there serving along side them. They imagined what would Amma be doing, and how She would be interacting with the staff, volunteers and guests there. A youth commented that imagining Amma there changed her perspective on the work she was doing, helping her to be more accepting and positive. 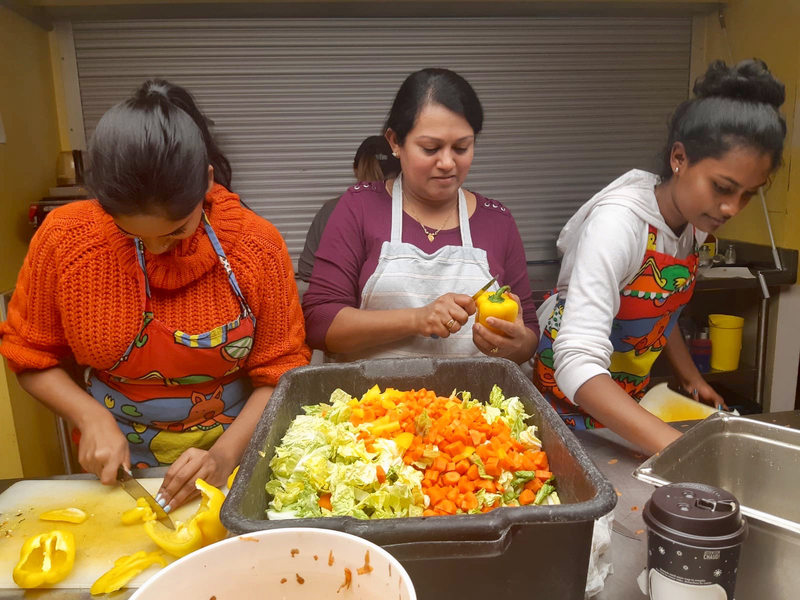 When she was part way through packing take-out lunches, the kitchen coordinator came to this youth and asked her to do the work over in a different way. Initially, the youth felt resistant, but then She thought of Amma, and how She would take re-doing the work in stride. The thought of Amma helped the youth re-do the task cheerfully. Upon hearing this, an AYUDH mentor who had grown up regularly visiting Amma's ashram in Amritapuri was reminded of when Amma would rush to do a dirty job which was avoided by everyone else. One time, while Amma was giving darshan, many women were waiting in a long queue to take a shower before going to see Amma. There were five ladies' showers, but the drains in three of them were clogged with hair, causing them to flood and become unusable. The women were waiting their turn to bathe in the remaining two showers. Eventually darshan ended, and still there were women waiting in line to bathe. Without being told anything, Amma immediately went straight to the ladies' showers after darshan. She put a plastic bag over Her hand and began pulling all the hair out of the clogged drains. Everyone around Amma was appalled that She was doing this dirty job Herself and asked Her to stop, but Amma continued with the work, and soon others joined in. In no time, all the showers are working again. To Amma no work is menial or distasteful. She is always prepared to take on any task to serve others. Amma says: "Every action that the disciple does as service to the Guru or to others becomes yoga, and leads him to liberation." Amma says: "We cannot know ourselves unless we are forced to face difficult situations. [...] Selfless service provides ample opportunities for such situations, and this will strengthen your mind so that you can overcome any situation in life." AYUDH Toronto's members and mentors are deeply thankful for the opportunity to serve, learn, and grow together at St. Felix Centre. They look forward to returning to serve there soon!